The Killing Season 3: Who's Out? The Killing has been revived by AMC and will be airing new episodes some time in 2013. But not all cast members will be returning to the rainy drama. 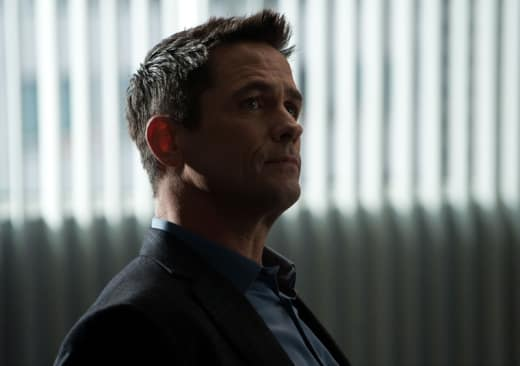 Variety confirms that Billy Campbell, for example, will not reprise his role as Darren Richmond, the Seattle city councilman elected mayor on The Killing Season 2 after being paralyzed and confined to a wheelchair. Elsewhere, neither Brent Sexton nor Michelle Forbes - who portrayed the parents of dead girl at the center of the ongoing story - will be back for Season 3. But the two leads aren't going anywhere. Mireille Enos and Joel Kinnaman are each expected to return, as these Seattle detectives were considered by many to be the only reason to tune in every week. Are you excited for The Killing Season 3?